Albert Park, a residential suburb with a large regional park and lake, is 3 km south of central Melbourne. It was named after Prince Albert, the Consort of Queen Victoria. There are two Albert Parks, one the large recreational parkland and the other the adjoining residential area which spread southwards from South Melbourne's Emerald Hill in the 1870s and 1880s. The parkland was like much of the land in the Yarra delta, swampy, grassed with sparse tree cover, and with occasional lagoons, some quite large. The lagoon in Albert Park was one of those. The land was used for seasonal grazing, recreational hunting, rifle practice at the Butts (the original name of the Albert Park railway station) and for military training manoeuvres between the Victoria Barracks, St Kilda Road, and the battery on Port Phillip Bay at the end of Kerford Road. In 1857 a railway line was opened through Albert Park from Melbourne to St Kilda. A short lived rail loop from Windsor to St Kilda (1859-62) passed through the south of the parkland. On 22 July 1862, the parkland was temporarily reserved from sale, and permanently reserved two years later. In 1875 the land between St Kilda and Queens Roads was severed from Albert Park and sold by the government as housing allotments. Between 1862 and 1875 Albert Park was reduced from 385 hectares to 231 hectares, the loss being accounted for by the Queens Road severance and an earlier severance on the St Kilda side. The St Kilda Cricket Club obtained permission to site its oval at the south end of the park in 1857 and the South Melbourne Cricket Club gained a permissive occupancy at the other end in 1862. The St Kilda Bowling Club obtained its parkland site in 1865 and the Middle Park Bowling Club in 1903. A third cricket ground, now the Albert Cricket Ground, predated the Queens Road severance. Its neighbouring tennis courts (1889) became the site for major championships until the Lawn Tennis Association built the stadium at Kooyong. In 1908 the Davis Cup was played there. The suburb of Albert Park extends from the St Vincent Gardens to Beaconsfield Parade and Mills Street. It was settled residentially as an extension of Emerald Hill, South Melbourne. In 1854 a land subdivision survey was done from Park Street, South Melbourne, to the northern edge of the parkland (Albert Road). St Vincent Gardens were laid out and the surrounding streets became the best address for successful citizens. Street names commemorated Trafalgar and Crimean War personalities. 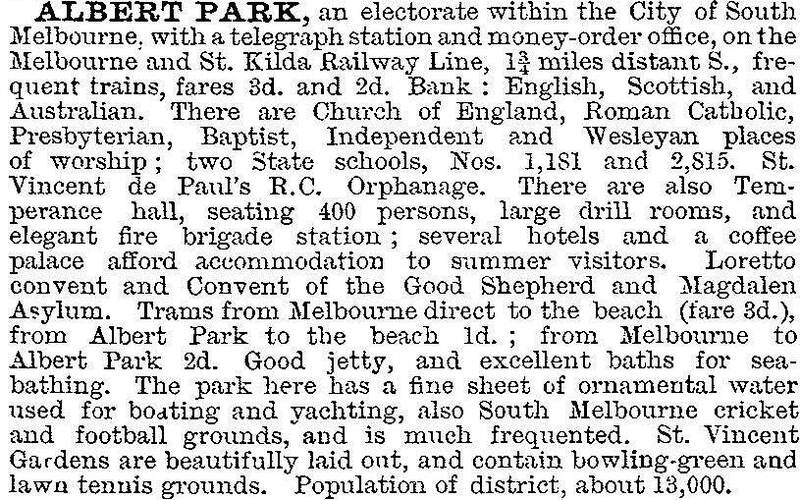 Albert Park had a railway station on the line from Melbourne to St Kilda (1857). In 1874 the State primary school was opened, which within twelve years had 1400 pupils. (In 2014 it had 476 pupils.) Its proximity to the beach encouraged swimming, and its 1905 squad included future champions, among whom was Frank Beaurepaire. Albert Park developed a strong shopping strip along Bridport Street and Victoria Avenue, along which a cable-tram service had been opened in 1890. The tram also opened up the South Melbourne beach to people who lived further away. St Vincent Gardens precinct, the former railway station (1888) and the primary school (1882) are heritage listed. During the prewar years some nibbles were taken out of the Albert Park. A precedent had been set in 1882 by the St Kilda Park primary school (after much opposition), and the South Melbourne Technical School (1918) and the MacRobertson Girls' High School (1935) were sited in Albert Park. The Army occupied large areas between 1941 and 1950, and in 1953 an Army officer proposed a racing Grand Prix in the park. Several races were held until stopped by the Government in 1958. The Army relinquished bits and pieces of space during the next twenty years. Commercial uses such as the Carousel restaurant raised some money for park maintenance, but the end of Army rentals caused further financial stringency. Rents from South Melbourne and St Kilda Football Clubs for their home grounds ended when they went elsewhere in 1982 and 1964. During the early 1990s the lake was emptied to remove weed infestation, and Melbourne Water assumed management from the local committee of Management. In December 1993, the State Government announced that the Australian Formula One Grand Prix motor race would be held in the park. Notwithstanding the protests by a Save Albert Park group the first race was held in 1996. The race circuit required trees to be cut down and facilities demolished, but funds were injected for replacement facilities. Albert Park suburb has houses which are larger and built more of brick than weatherboard compared with South Melbourne. They have maintained their appeal to home buyers. In 1987 the median house price in Albert Park was 60% above the median for metropolitan Melbourne, and in 1996 80% above. The socioeconomic level is reflected by the outdoor cafes in Bridport Street. At the western edge of Albert Park the South Melbourne gas works was made into a park in 1982 with creative workshops and a gallery. Albert Park secondary college (1971) is nearby. The South Melbourne Technical school was at the corner of Albert and Canterbury Roads, and to its south there were playing fields. In 1997 the ovals were replaced by the Melbourne Sports and Aquatic Centre, which has several pools and over 30 indoor courts. The technical school building is used as offices for sports organisations and for sports training. Albert Park has tram lines along Bridport Street/Victoria Avenue, Albert Road/Mills Street (1890, 1925) and along Canterbury Road (1987, former the train line). At the 2011 census nearly 9% of residents recorded Greek as the language spoken at home, a reminder that Greek migrants dominated the suburb’s intake in the 1960s to 1970s. South Melbourne Hellas Soccer Club (1958) played at the Lakeside oval.